Ye’llo, all you nerdy chess lovers out there! Are you such a good chess player? 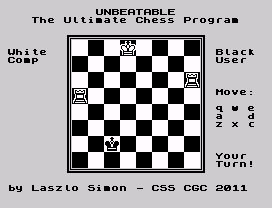 Can you easily beat any chess simulator on the humble Speccy? Are you fond of showing your abilities in front of your mates (if any)? Well – here’s a real challenge. I think it’s about time some of you bite the dust, and this program is specifically designed to make you do so. In the author’s own words, this may be the fastest, yet thoughest AI you’ll ever find in a chess simulator. The computer takes almost no time in calculating its next move, I can tell you that most of the time it will be you who’s delaying the game. Your goal is simple: win the game. The main feature in this entry is that it has been created in a such anti-totalitarian fashion: forget about a set of disposable minions to solve your problems. You, as the black king, must do it yourself. That’s how it should be done. Now, good luck! Use Q W E D C X Z and A to move your king. If you have ever used Melbourne Draw, you know the drill. Categories: Entries. Tags: hard, nerdy, simmulator. And here it comes, the second entry in a row by Baron Ashler, and yet again a nice contestant rescued from the sands of time. This time showcasing awesomely digitized speech (using Speak Easy, I could bet!). Spanish readers, if any, will recognize the sample. Yes, it’s the great Joaquin Prat (rest in peace), who hosted the Spanish equivalent to the price is right in the late 80s. This made me be in the greatest mood to play El Millonario, with nice childhood memories and all… But all this feeling disappeared as soon as I started the game. Fellow reader, if you have been a wannabe coder sometime in your 8-bits life you HAVE to have coded a game like this. Move your slow soon to become a millionaire left and right, avoiding the big O and trying to catch the big $. And that’s all. Forever and ever. So have fun. Mr. Ashler comes in strong, it seems, with a couple of entries which can’t be easily beaten in the crap department. I won’t tell you the keys. Have fun finding them yourself! Categories: Entries. Tags: simmulator, Spectrum 48K. Categories: Entries. Tags: maths, parody, simmulator, Spectrum 128K. What we got here? Nothing less than an interesting scientific paper on diffusion? You know, such things that happen when you spill your sugar all over the carpet, or when you drop a box of screws. The laws of diffusion are those which make your contact lenses to roll under the sofa. And our friend Richard May has elaborated a nifty piece of coding just to show us what we already know. Boosting an impressive colour clash-free graphic technique, the program asks us a few questions (nothing personal, don’t worry) and then proceeds to randomly draw lines over a grid. And when it’s done, you can even start over, answer the questions with different values, and get a different picture. Even if you enter the same values, the picture displayed is completely different. That’s the magic of diffusion! Now we have learned something new. Besides, with some luck, the program can create some awesome patterns you can use as a guide if you enjoy cross-stitching. Then you can decorate your home with actual science! Only on CSSCGC, ladies and gentlemen. Categories: Entries. Tags: science, simmulator, Spectrum 48K. This one has come unexpectedly (maybe we got used to the excesive amount of hype our previous entry got before being released) and with extra crap-factor due to the fact that Ben sent it to the wrong email address. The game opens with an awesomely digitized opening screen which shows Dr. Who in a woman costume, which leads you to believe that the game is going to be about trans-gender activities, but you are wrong in such belief. In fact, the game is about the ancient art of boiling water so you can enjoy a good cup of tea. You know a good boiler when you meet one: somebody who can deliver a great tea time experience in the less amount of time possible. And this simmulator is just about that: manage to boil the water in the pot as soon as possible. For such a noble cause you can use keys Z, X, which you have to press alternatively as fast as you can. You will literally watch the pot making the water boil thanks to the awesome animated affects Ben has added to the experience (completely unneeded as they don’t affect gameplay, but who’s gonna complain for some free-of-charge eye candy?). In sum, Watch the Pot is an awesome community game – you can bring your friends home and spend hour after hour competing on who can make tea faster! There’s no limit in the amount of players who can enjoy this masterpiece. Z, X – boil water. BREAK – become a hacker. Categories: Entries. 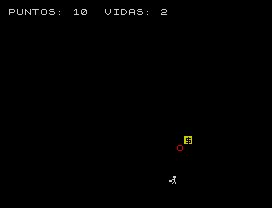 Tags: community game, simmulator, Spectrum 48K.